Mr. Tfwala who was admitted at Hope was assisted by the social worker, who went around looking for his home until he was finally taken home, but the family did not accept him, stating that he is a witch, he has killed many people and they don’t want him in their home etc. Finally the social Hezekiel Ngwenya successfully managed to solve the problem and found a home for Mr. Tfwala. Our Bishop Jose Visited Hope House and encouraged us to continue the work for the poor and sick people of our Nation. 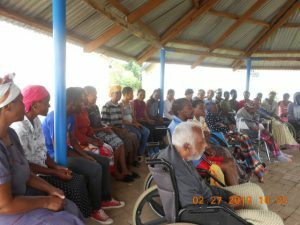 February 11th, we celebrated the World Sick day at Hope House and the Consolata priest Fr. Francis, who is the Chaplin of Hope House , prayed over, the staff, the sick and care givers. He shared the word of God with them. All were served with snacks at the end of the programme. We are ever grateful to Fr. Mark who assisted us with the anointing of the sick & Fr. Rocco who is always available. The ECG Church members came in good numbers to pray with the sick and donate food items for them. They all enjoyed the food and were indeed very grateful to the church members for their generosity, love and care. At the end, the clients and minders thanked them for their generous contribution. Nkhosinathi Matsebula 17 years who was born with HIV was admitted at Hope House together with his mother who is on ARVs on the 21st February, today he has made a big difference in his health condition, he gained few kilos, looks cheerful and happy, as soon as he is discharged he will be back to school. Jacqueline, the staff Nurse gave Health education on Diabetic mellitus, since we had many clients at Hope House with Diabetic mellitus. It was educative and informative and they had a lot of questions to clarify their doubts. Hope House continues to be a full house and people who are discharged and walking back home are on the increase, we are ever thankful to all those who assist us in all our needs.